They are characteristics of the precision of the instruments and accuracy of the altimeter pointing. They are also representative of the quality of the retracking processing. The internal calibration that takes into account the transit time of the data in the antenna. Still, the models and corrections used to mitigate the effects are not perfect, and there might remain some residual errors. They are mainly characterized by uncorrelated measurement noises (see specific chapter). The path of the electromagnetic signal goes through the atmosphere that influences the measurement. In the same way, the sea state bias (presence and shape of the waves and roughness at the surface) also introduce an error on the measurement. The dry and wet troposphere corrections that correct the path delay effects linked to the presence of dry gases and water vapor in the atmosphere. The ionospheric correction that allows to take into account the effect of the ions present in the atmosphere. The sea state bias correction that correct the effects of the sea surface state on the reflection of the altimeter signal on the surface. In spite of these different corrections, part of the environmental errors can still be observed in the along-track SLA signal. They can be spatially and temporally correlated. They mainly consist in subtracting from the measurement some physical signal that cannot be accurately sampled with the altimeter (due for instance to the inconsistency between the temporal sampling of the altimeter and the temporal scales characteristic of the signal considered) or that are not of interest for the study of the dynamical signal. 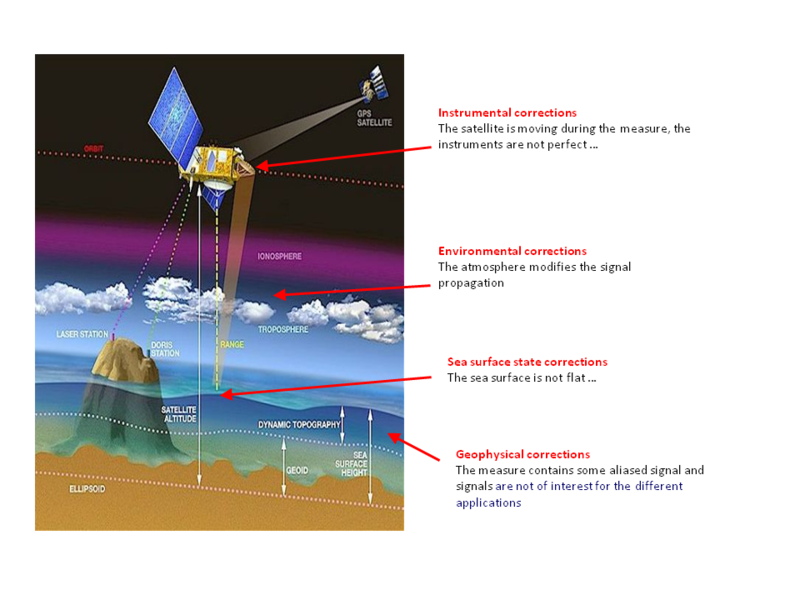 In that way, different geophysical corrections are applied of the altimeter measurement (geoid, ocean tide, inverse barometer and high frequency wind and pressure effects, etc.). See Table 9 for the details of these corrections. The quality of the different corrections that depend on numerical models, can lead to uncertainty in the different geophysical corrections applied. They are considered as errors on the SLA product, for the main part correlated in space and time. The quality of the merged L4 products directly depends on the quality of the L3 products used in input of the L4 processing. Nevertheless, the main source of error comes from the sampling capability of the altimeter constellation. The more altimeters are available; the best is the mesoscale sampling. Another source of error for L4 products is directly linked to the methodologies and parameters applied for SLA interpolation on a regular grid. Optimal Interpolation (see DUACS processing) used in DUACS processing does not allow the restitution of the full dynamical spectrum limiting the capability of retrieving small mesoscale in L4 products (Chelton et al, 2011 and 2014). The noise measurements are mainly induced by instrumental (altimeter) measurement errors. They are quantified by an analysis of the wavenumber spectra of the SLA (figure). Indeed, the uncorrelated measurement errors is the noise level estimated as the mean value of energy at high wavenumbers (wavelengths smaller than ~5km). It follows the instrumental white-noise linked to the radar speckle noise. For the conventional radar altimeter measurements, the inhomogeneity of the sea state within the altimeter footprint also induces an error visible as a “hump” in the wavenumber spectra of the SLA. It is also included in the noise measurement for the 1Hz product resolution. The full understanding of this hump of spectral energy (Dibarboure et al, 2014) remains to be achieved. This issue is strongly linked with the development of new retracking, new editing strategy or new technology. For the SAR measurement, part of the high frequency signal is characterized by a correlated signal (figure). This signal still need to be fully explained. At this time, it is considered as an additional unknown signal that is assumed to be a “red noise” error considering the ocean geostrophic signal. The presence of noise measurement on along-track products limits the observability of the shorter mesoscales. 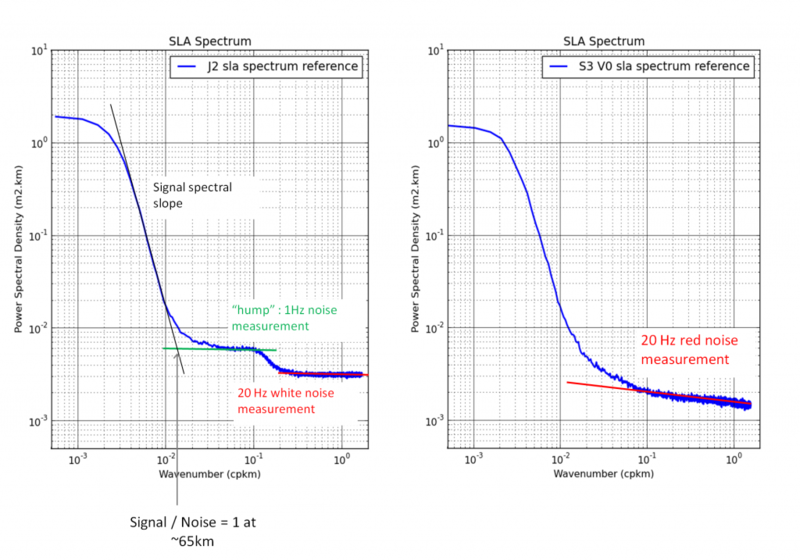 The SLA power spectrum density analysis was used in order to determine the wavelength where signal and error are on the same order of magnitude (figure). It represents the minimum wavelength associated with the dynamical structures that altimetry would statistically be able to observe with a signal-to-noise ratio greater than 1. This wavelength has been found to be variable in space and time (Dufau et al., 2016). The mean value for Jason-2 was found to be nearly 65 km. The altimeter observability however varies with the altimeter considered (instrument characteristics and precision), the geographical location (correlation with the significant wave height, rain cells) and period considered (Dufau et al., 2016). Mean wavenumber Spectra of Jason-2 (LRM measurement, left) and Sentinel-3A (SAR measurement, right) SLA over the global ocean. Produced by CLS. The Orbit estimation is usually more precise in delayed time conditions due to more precise environmental model (pole position, solar activity) and different techniques (DORIS; GPS) used in real time or delayed time conditions. These differences can induce several cm differences on the Sea level. 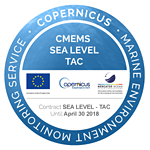 The measurement calibrations (radiometer, altimeter, …) processing are usually more accurate in DT conditions. It is the case for example for the radiometer measurement that can be impacted by drift or significant jump induced by inaccurate NRT calibration processing. Additionally, possible altimeter standard changes in the altimeter L2p products used in input of the DUACS processing can induce jump in the SLA field. The management of these jumps, necessary to ensure a seamless transition for the users, is more precise in DT processing. Additionally, part of the DUACS processing is also less preferment in NRT conditions. The multi-mission cross-calibration processing (e.g. Orbit Error Reduction (EOR) and Long Wavelengths Error (LWE) (see “homogenization and cross-calibration processing”) is more accurate when using a centered temporal window. This is not possible in NRT processing since measurements in the future are not available. For these reasons, we do not recommend to use NRT products for climatic scale signal studies (e.g. MSL trend, see FAQ). The availability of altimeter measurements potentially reduced in NRT condition due to problem on platforms or ground segment, usually retrieved in DT conditions. The uncentered temporal window used in NRT L4 processing since measurements in the future are not available, reducing the amount of data by a factor 2 compared to the DT conditions. The last one is considered as the main sources of errors for mesoscale signal reconstruction in L4 NRT products as discussed in Pascual et al (2008). The authors showed that at least 4 altimeters are required in NRT conditions to retrieve the same accuracy of the DT products generated with only 2 altimeters.